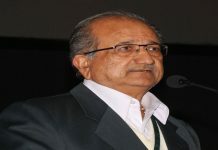 In the interest of the state and the country, regional ­­parties should take over the reins following the forthcoming elections. Kashmir has been a graveyard of reputations. The upcoming assembly election offers a unique opportunity to set the record straight, if only major political parties in the state can see the big picture rather than being guided by narrow political considerations, born out of quest to somehow grab, and stay in power. The National Conference (NC) and Cong-ress have between themselves ruled the state for most of the time. The Congress also shar-ed power with arch rival People Democratic Party (PPD) between 2002 and 2008. Of the 87 seats in the state assembly today, the NC has 28 seats and Congress, 17, while the opposition PDP has 21. 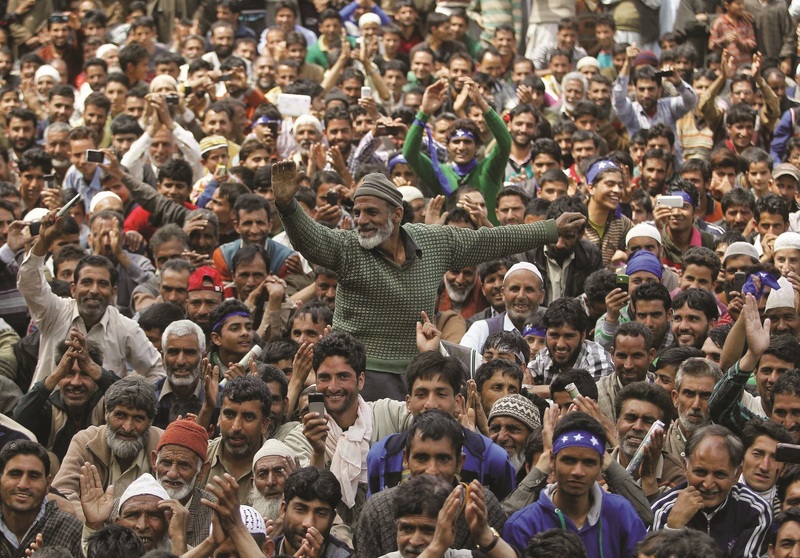 Supporters of NC at an election rally in Sonawari, north Kashmir, during the 2014 Lok Sabha elections. An election rally of People’s Conference. With elections round the corner, a rejig of the political alignment is on the cards. There is no clarity on the future of the NC-Congress alliance for the upcoming assembly elections. There is talk of the BJP and PDP joining hands, though both have officially denied any such move. Both have formally launched the “44+ mission”, signifying their urge to capture power on their own in the state. 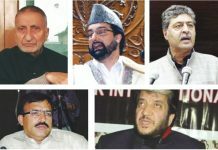 The PDP leadership has lauded the new government at the center, especially its decision to open dialogue with Pakistan by inviting Prime Minister Nawaz Sharif to attend the swearing-in ceremony of Narendra Modi. Congratulating Modi for his party’s landslide victory in the general elections, PDP patriarch Mufti Mohammad Sayeed said he was hopeful that the new government would take tangible steps for a lasting solution to the Kashmir problem. He wished that the government would pursue an agenda, which would be “politically-inclusive and developmentally-intensive”. The PDP has, on earlier occasions, labelled the BJP as a “communal” party. But a post-poll alliance is likely in the event of either of the two falling short of a majority target. In recent times no single party has bagged majority in the state election. PDP Party president Mehboba Mufti adressing election rally in Bhaderwah in Jammu and Kashmir. As they say, there are no permanent friends or foes in politics. The journey of coalition politics in India is replete with instances of politics making for strange bedfellows. Each somersault brings with it pro-mise of quick political dividends. That is why, when JD (U) leader Nitish Kumar embraced arch rival Lalu Prasad Yadav, morality lessons took a backseat to make way for realpolitik. And when Ram Vilas Paswan joi-ned the chorus to pitch Modi as the prime minister, not many gave him a chance. But he had the last laugh, bagging six seats and a meaty portfolio in the cabinet. But should narrow political calculations always dominate larger national interest? Should brazen political alliances be allowed to stifle local and regional aspirations, especially in border-states like J&K? The alliance between a regional party and a national party in J&K has obviously not yielded the desired results. This is primarily because the regional party stands to lose its regional identity when in power. It is important for a regional party to espouse the regional concerns, which it fails to do in a marriage where a national party is a partner in power. The regional sentiment often brands such alignments as sell-outs. While taking up the regional and local issues, the regional political outfit can also work as a shock absorber for any anti-India sentiment. In this arrangement, the center becomes a macro partner, leaving the micro management to the regional party. This would enable the trust deficit to be bridged, with clear cut roles being apportioned to the center and the state. The Congress and the PDP shared power (2002-2008), with the PDP getting a shot at the top slot ahead­ of Congress. Sayeed became the chief minister, but trouble arose when Congress appointed Ghulam Nabi Azad as the chief minister. No doubt it was part of the deal but heavens would not have fallen had Sayeed been allowed to run the entire tenure under close watch of the alliance partner on performance. It is no coincidence that after Azad took over as the chief minister, the state was plunged into a major political and administrative crisis over establishment of temporary shelters along the route of Amarnath Yatra. Ironically the temporary shelters come and go every year for the yatra but the issue got politicized into a national crisis, with violence spreading to other parts of the state. In the midst of violent protests in the state, the PDP said it would withdraw support if land transfer for temporary shelters for yatra pilgrims order was not withdrawn. The order was revoked but the PDP did not lend support to Congress government. This forced Azad to step down on July 7, 2008. When at 38 Omar Abdullah became the chief minister of the state in January 2009, he rode a wave of hope. He became the youngest chief minister on the promise of new ideas for a new generation in the strife-torn state. The expectations were unprecedented and not without reason. With the Congress as its ruling alliance partner, Abdullah had all the support of the center. His personal equations with Rahul Gandhi made it a dream come true for people in the valley and the state. But five years is a long time in politics. The National Conference-Congress alliance now stares at a bleak future in the upcoming assembly elections. The Lok Sabha verdict in the sensitive state has dealt a severe blow to the ruling alliance led by the National Conference. For the first time the party failed to win a single seat in general elections. The defeat of former chief minister and former union minister Dr Farooq Abdullah has come as a rude shock to the party cadre and alliance mandarins. The honors in the Lok Sabha elections were shared equally between the BJP and the PDP each bagging three parliamentary seats. The BJP has for the first time captured the largest vote share. What lies in store for a common voter, as the state goes to polls in a few months? This might well be the first time in many years that there are no pre-poll alliances.This is a definite positive development. The two main regional parties in the valley—the NC & PDP—have a great opportunity to come clean of their past and present a fresh face to the voter, where they show a path to development and are willing to be held accountable for it. Both the parties have leaders who hold promise. Young Abdullah would hopefully have learnt his lessons. Mehbooba Mufti surely knows it is her big chance to not only come out of the shadow of her father but also present her party as a viable alternative. The two national parties in the fray—the BJP and Congress— have their role cast. The BJP is keen to ride the Modi wave to score big wins in the Jammu and Ladakh region. Fair enough, but it should just shy away from any post-poll alliance with the PDP. The Congress might well try and rebuild the party in the state. But it needs to formalize a change of guard by bringing in new-age leadership. Salman Soz, who has served well as the Congress spokesman during elections, needs to be given charge to focus on building confidence in the ranks. Being single should be fashionable this poll season in the state.